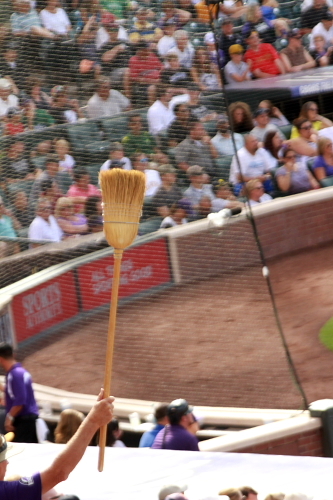 The Rockies sweep the Pirates! Today was another early start for a 2:10 game I arrived at Coors about 9:30, I was not gonna go early since I did not have to because it was not a bobble head day, but since I started the Pirates photo I wanted to see if I could get a few more guys on it. So I waited by the players entrance and got A.J. Burnett and Jared Hughs so for the 3 days I got 9 autographs on it in all. Not bad for an away team. It was an Autograph Sunday and since there was a few guys up that I needed on my team 16×20 I brought it and I was kind of lucky since 2 of the 3 guys I needed that are up signed. I needed both Jeff Manship and Charlie Culbertson. The 2 other signers were Jonny Herrera and Josh Outman. So I have a total of 49 autographs on my team 16×20 almost everybody who wore a Rockies uniform for at least a game. Still missing 4 Mitchell Boggs who is in the Springs and Colin McHugh also in the Springs, Roy Oswalt who is on the D.L. and Chad Bettis who is with the team. 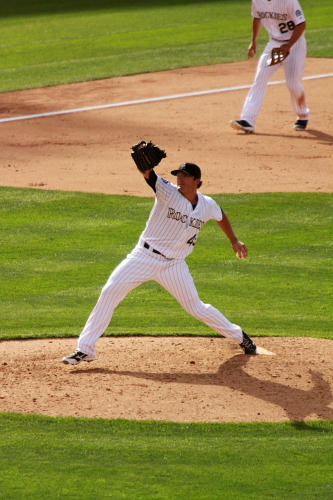 Chad Bettis made the start for the Rockies this game. 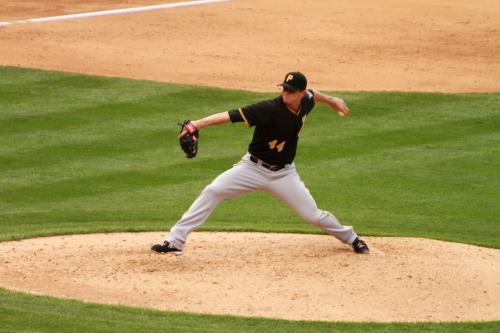 He had a strong 1st inning facing 3 batters striking out 2 Alex Presley who lead off and Andrew McCutchen. 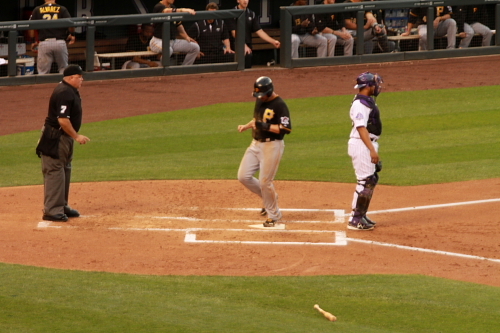 Jeff Locke started for the Pirates he did allow a base runner when he walked Troy Tulowitzki with 2 outs. 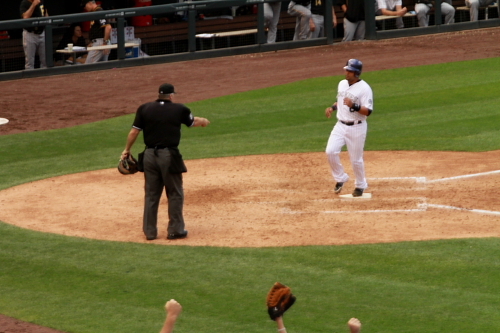 He did get the next batter out Wilin Rosario. 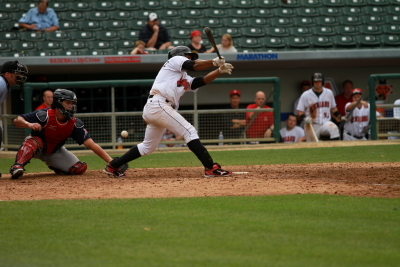 Wilin Rosario hitting into a ground out in the 1st. inning. 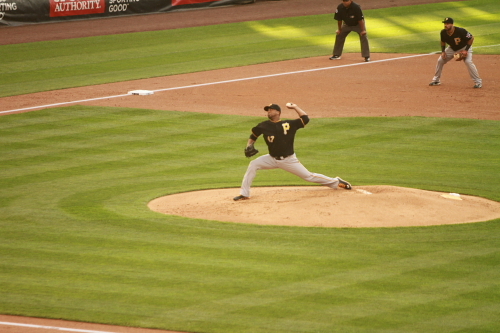 Chad pitching in the Second inning Pedro Alverez started the inning with a home run to put the Pirates up 1-0. 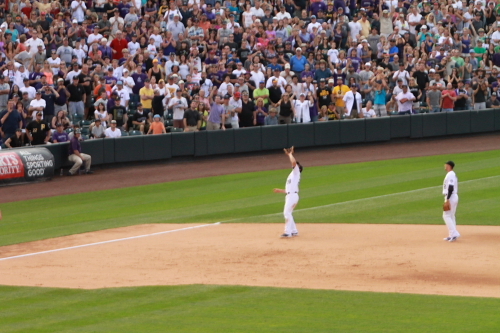 Tulo showed his best Jazz hands during his 4th inning at bat! He walked this at bat. 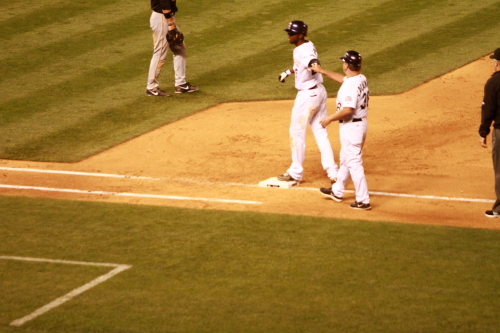 Charlie Blackmon gets back to first after his 5th inning single. Not much happened in the fifth. 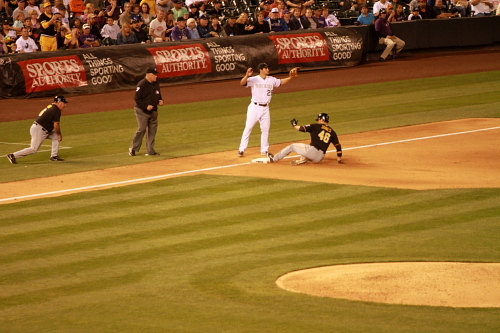 The Rockies did get a few base runners but failed to score, Blackmon did get to third. 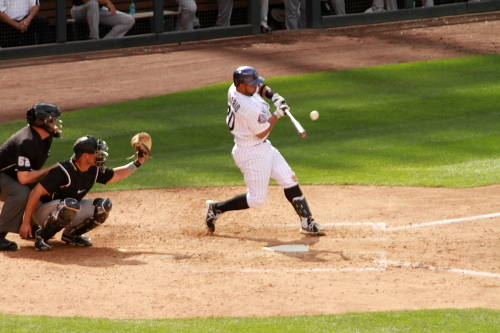 Torrealba scoring the Rockies tying run. Wilin Rosario hitting a single in the 7th inning with 2 outs. 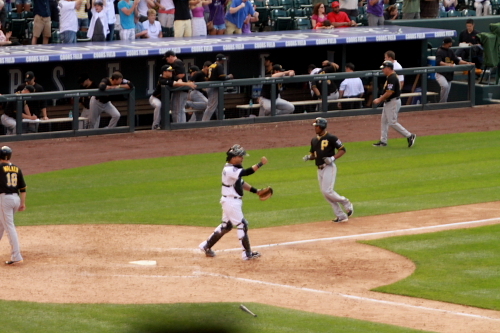 Rosario scored on a Nolan Arenado double his 20th of the season. Not bad since being called up in late April! along with his 9 home runs, 3 triples and 40 RBI’s. 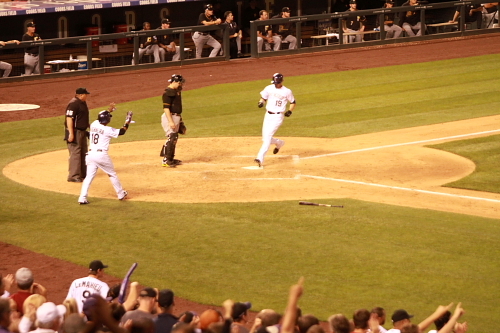 The Rox took a 3-2 lead. 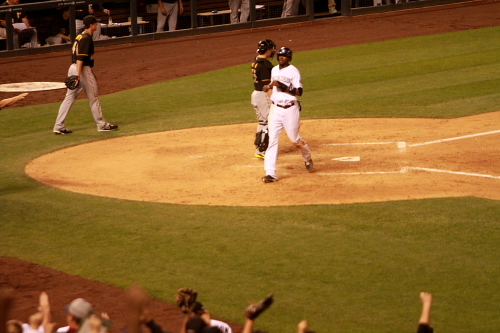 Andrew McCutchen striking out in his 8th inning at bat. 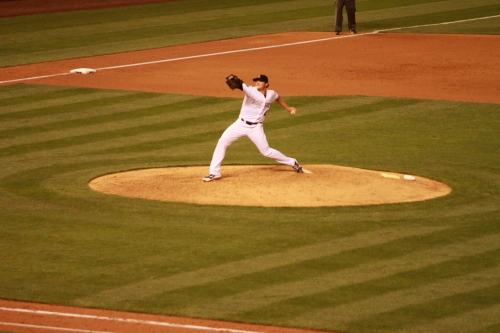 Matt Belisle pitching in the 8th inning for the Rockies. 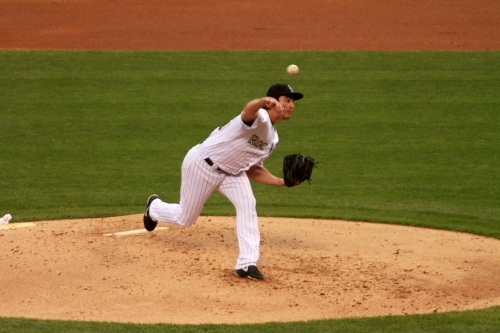 Bettis pitched a complete 6 inning allowing the 2 runs on 4 hits and Striking out 3 and walking 2. Corpas pitched the 7th and Belisle in the 8th. 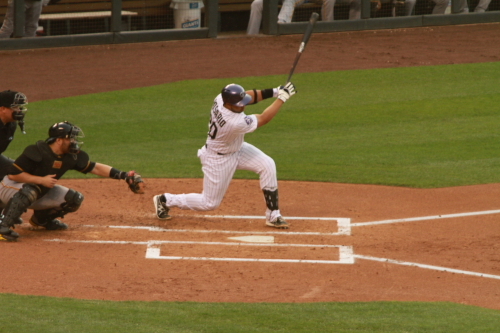 Todd Helton came into pinch hit in the 8th inning for the Rockies. 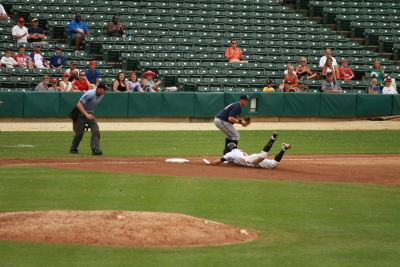 Unfortunately hit into an inning ending double play. 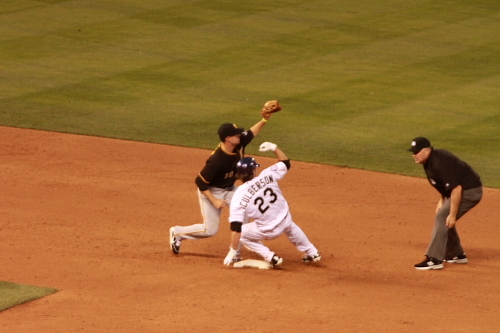 Yorvit was out at second on the Helton double play. Rex brothers came in for the save and made the game interesting again. He gave up a single to Neil Walker start the inning. 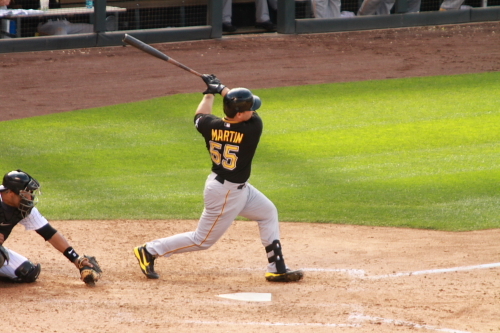 After striking out Russell Martin who pinch hit in the inning for Garrett Jones, Tony Sanchez hit a double Martin went to 3rd. 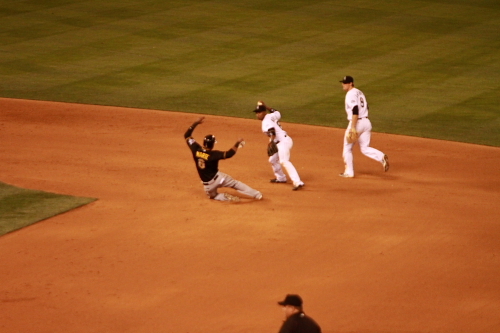 Starling Marte came into pinch run for Sanchez. 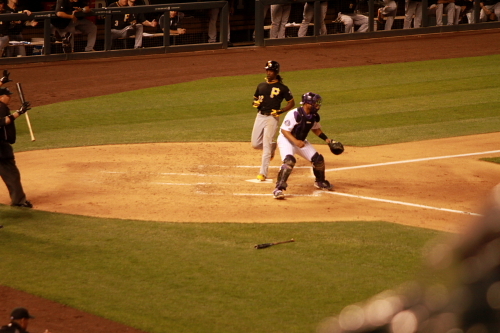 Jordy Mercer would line out for the second out and Gabby Sanchez was intentionally walked to load the base’s when he pinch hit in the pitchers spot. Alex Presley would pop out to Arenado at third to end the game and the Rockies got the 3 game sweep o the Pirates it in the first time they swept a first place team since 2010. It was a great series with three really great games. Things really seemed to change in this home stand. 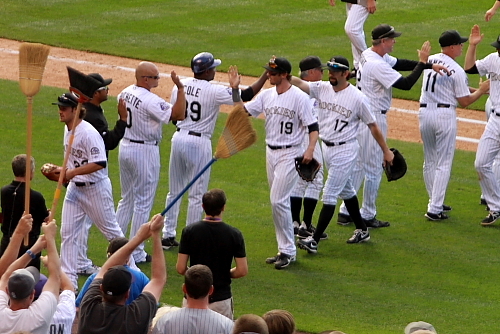 The Rockies celebrate the sweep of the Pirates. The Pirates are a strong team and defiantly be my team to root for if they make the play off a bunch of really good guys and they are the Rockies central, so it would be great to see the Clints Hurdle and Barmes do well again. The Rockies are Currently playing a series with the Padres which I will be getting to all 3 this week. 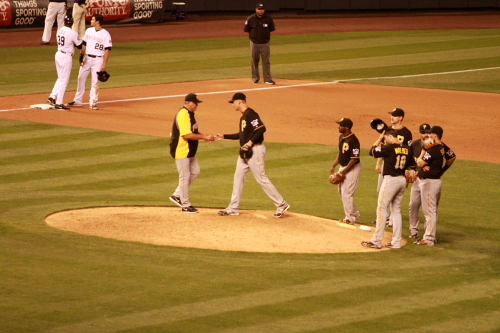 Well That is it for this game and well see you at Coors. The Power are the low single A affiliate of the Pirates and the Kannapolis Intimidators are the low A affiliate of the White Sox. This is my 8th game on the road trip. 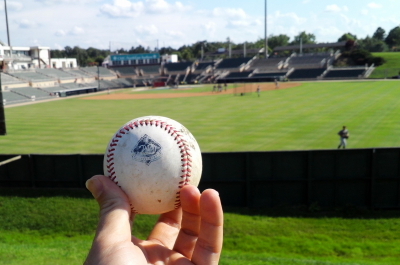 Since I was heading to charlotte to see my Cousins that live there I figured I would go to a game in Kannapolis I have been there before, but since I have never got a South Atlantic League Ball I knew they had a spot where you could watch batting practice and see if I could snag one so I headed out behind the field and almost immediately found a ball. Here it is before I picked it up. So I was like great I finally got the elusive S.A.L. ball. I pick it up and it is not a S.A.L. ball but and MLB ball I than noticed that it had a logo and I just laughed…..
….because here I am 1600 miles from Denver and the first ball I find was a 20th Anniversary Rockies logo ball. Now they have been hard to come by in Denver unless you get a game ball or a toss up during practice. So I kept searching for the S.A.L. ball and the next one I found was a Minor League practice ball. 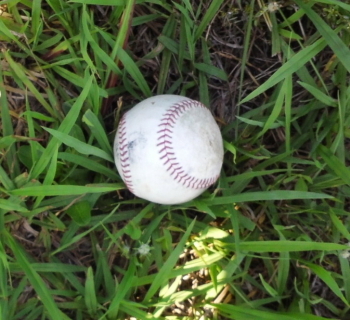 By then One of my cousins headed out and found another Minor League Practice ball still not finding a S.A.L. ball. Now the reason I have called the S.A.L. ball elusive is because of the amount of game I have seen in this league and have never got one. Many of the stadiums don’t have great availability for batting practice and I have never got a game ball from any of them and that was with seeing 3 games in Greensboro, 2 in Ashville, 1 in Lexington and the previous game in Kannapolis. So 7 games in the last 3 years and did not get one. So I than found one and the quest for the Elusive S.A.L ball was over not even 2 minutes or so later I found a second!!!! These are the 2 S.A.L. 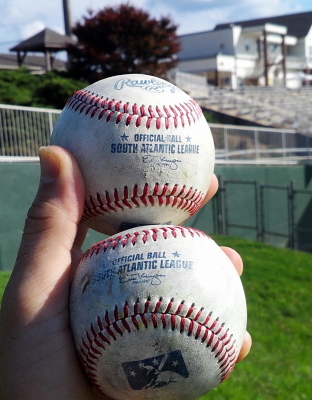 baseballs I found on my Easter egg hunt behind the stadium. In total I found 4 and my cousin found 1 and a half basically he found a ball with no cover that was pretty beat up. It was time to head in, one of the biggest differences was they had changed the stadiums name since the last time I was there. It use to be Fieldcrest Cannon Stadium. It is now CMC-Northeast Stadium. 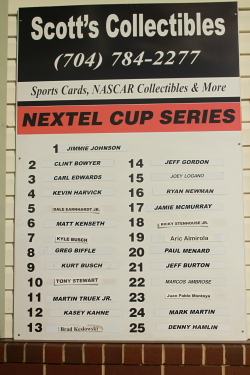 An interesting thing they do in this stadium is post the Nextel Cup standings. Here is a view of the main building at the stadium. 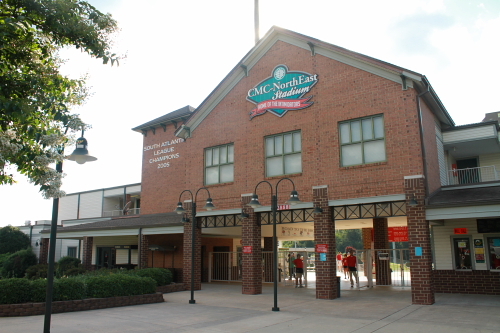 It is where the main entrance is, souvenir store and the stadiums suites are located! even the last time I mentioned that this stadium felt like it was in someone’s back yard which is something I like about this stadium. 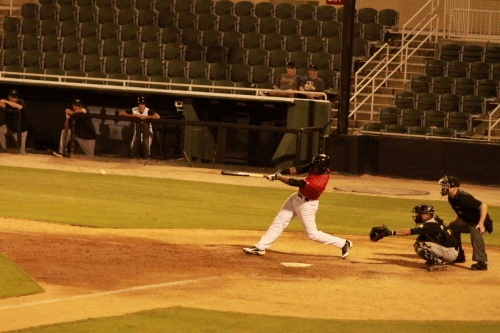 Here is a link from my last game in Kannapolis. The players cam out to warm up and after the normal stretching and throwing they broke up into groups of 4 and played pepper which is a exercise/game that was more common years ago. this is the first time I have seen it. 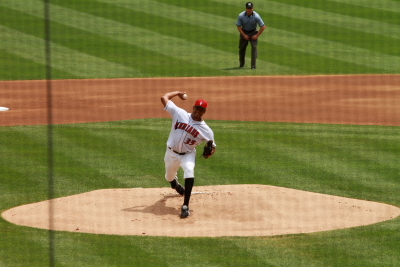 Braulio Ortiz throwing the first pitch to Barrett Barnes, he would hit a lead-off single. 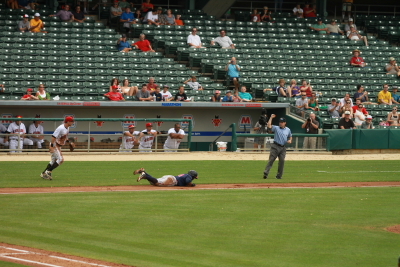 Barnes dives back on a throw over to first base. 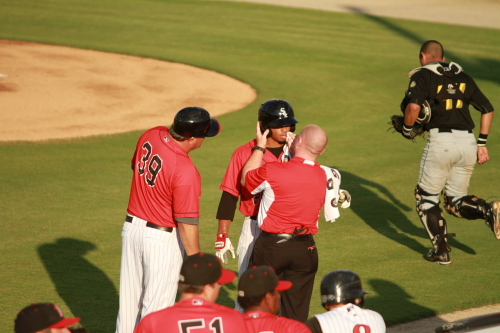 The second batter for the Power Dilson Herrera popped out to the Intimidators catcher Brent Tanner. 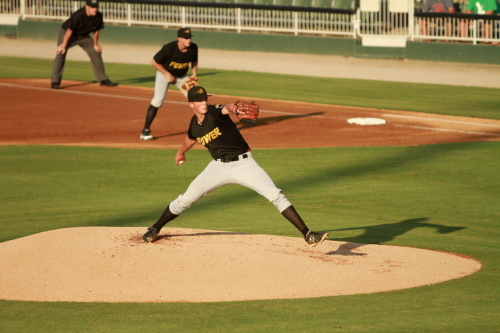 Tyler Glasnow was the starting pitcher for the Powers he is currently the #19 prospect in the Pirates organization. 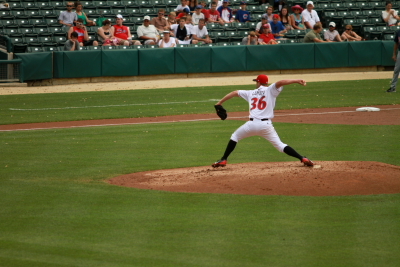 Besides hitting the second batter in the inning he pitched very well striking out 2 in the 1st. 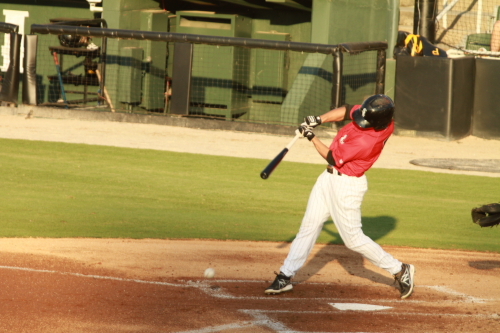 The Intimidators first batter Jacob May broke his bat on Glasnows first or second pitch. May hit him self with the handle part of the bat. The trainer actually use the towel they always come out of the dugout with. 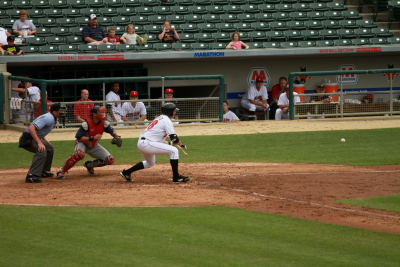 After he got back in the box he hit a soft hit that the Powers third base man fielded for the out at first. 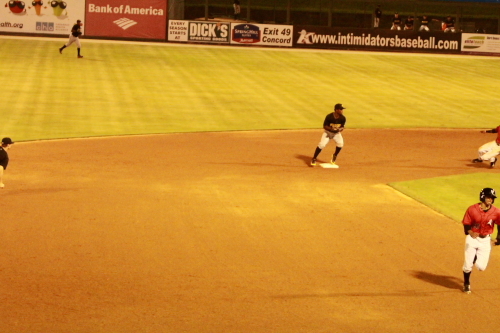 The batter that did get on base in the inning was Tim Anderson, after getting on base he stole second! The Powers lead off batter in the 2nd was Eric Wood. 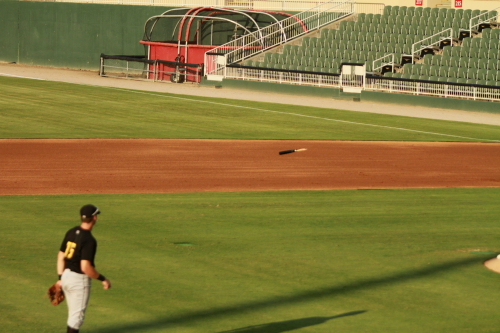 He hit the ball to the track in center, but it was caught by Kannapolis’ center fielder Jacob May. The Power would have 2 runners in the inning. Max Moroff the second batter of the inning walked and the third Walker Gourley reached on a fielding error by the short stop Tim Anderson. 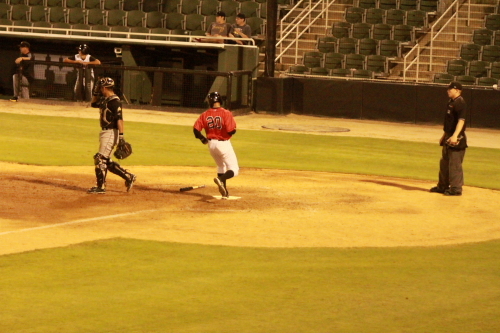 Designated Hitter Michael Johnson hitting a 2nd inning single to Eric Woods at third. 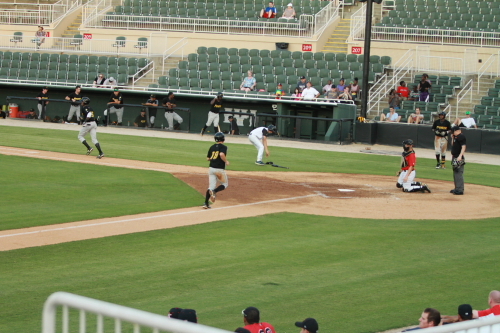 Johnson would reach base on a throw that got past the Powers first base man Walker Gourley. 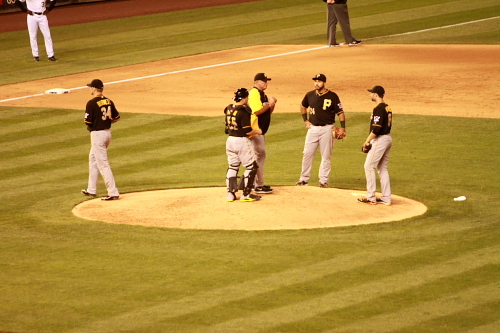 It was not ruled an error it was a base hit foe Johnson. 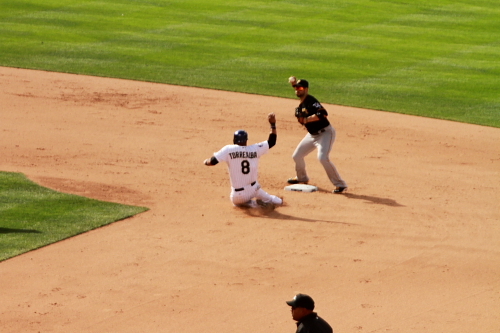 He may have been able to get to second but remained at first. 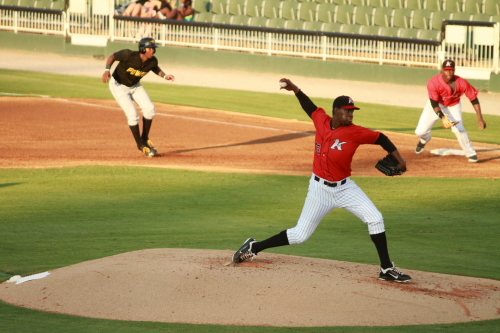 Ortiz pitching with a runner on in the 3rd inning. 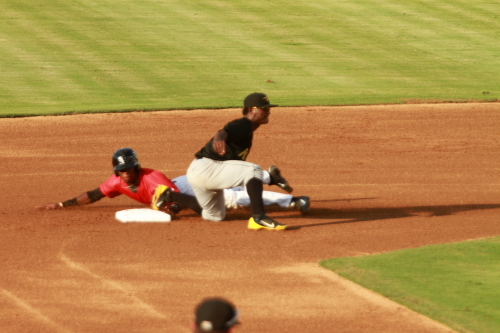 The runner for the Power was Josh Bell who hit a single to get on base. Both teams failed to score in the 3rd. 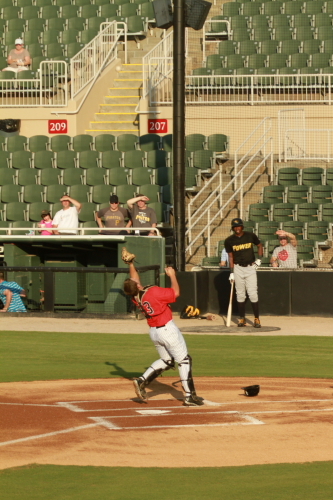 The Intimidators did have a scoring opportunity Kale Kisner reached on a single but was throw out at second trying to steal second base two batters later Tim Anderson hit a double which most likely could have scored Kisner from first or second if he did steal the base successfully. 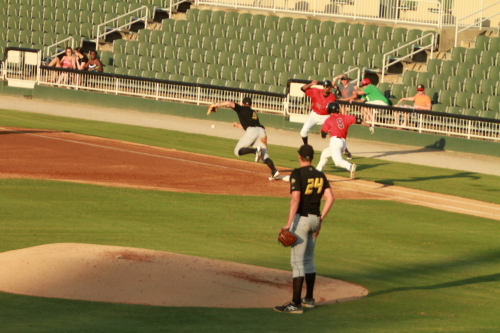 That would have given the Intimidators a 1 run lead. 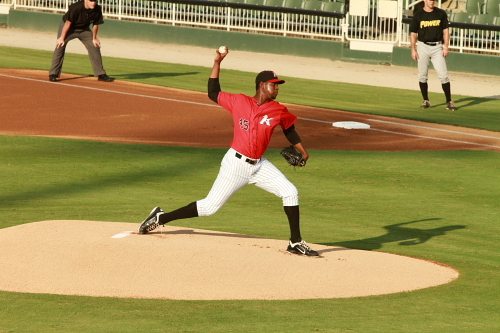 Things got very rough for the Intimidators starter Ortiz in the 4th. After Max Moroff singled with one out. 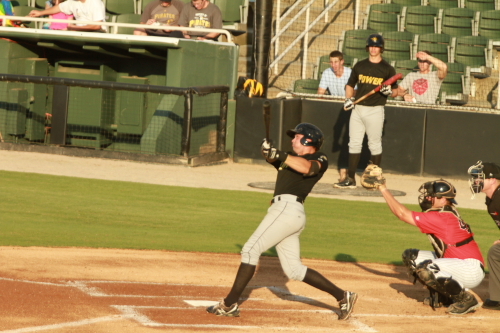 Walker Gourley followed that up with a single also then two batters in a row walked first, Francisco Diaz and then Raul Fortunado. The second walk brought in the Powers first run scoring Moroff from third. (1-0) Power Their second run came on a sac fly by Barrett Barnes to center and that scored Gourley. (2-0) Power. Besides the 4th inning runs Ortiz pitched well he did work himself out of a situation with 2 runners on in the 2nd and he stayed in the game through the 6th inning. After the 4th inning he came out very strong in the 5th. the first batter of the inning Josh Bell grounded out and he then struck out Jordan steranka and eric would to end the inning. 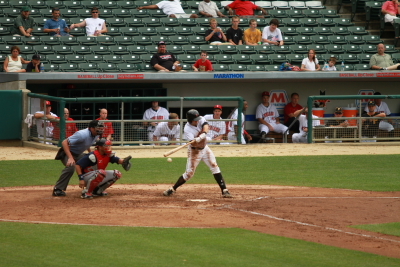 He did walk the lead-off batter in the 6th but then had the second batter hit into a double play by keeping the ball low and on the ground for hits and finished the inning with his 4th strike out of the game. 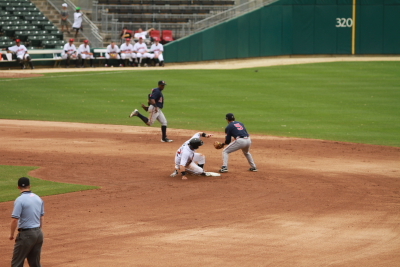 Max Moroff sliding into 3rd on the Gourley single. 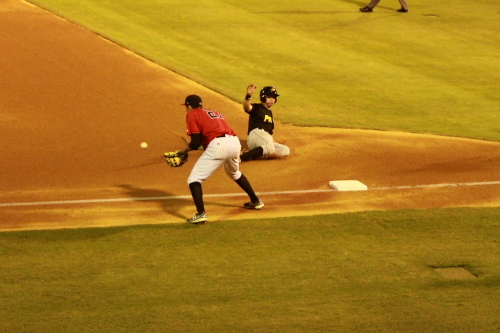 Jason Coats hit into a double play with runners on 2nd and third. 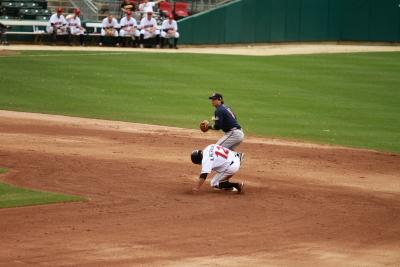 The Powers Dolson Herrera stepping on second and turning the throw to first. 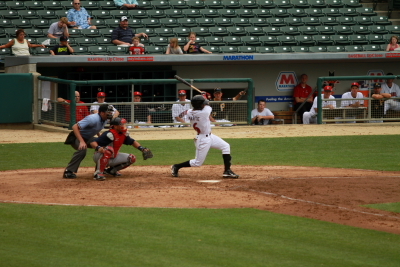 Keon Barnum hitting a RBI scoring single. 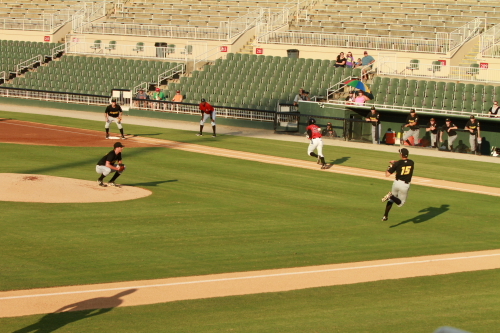 Jacob May scoring the Intimidators first and only run in the 9th inning. 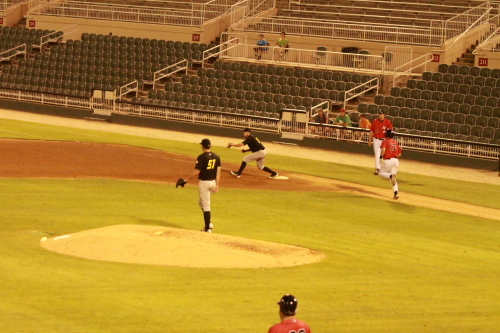 Brent Tanner would ground out to end the game. The Power would win with the 3-1 score. 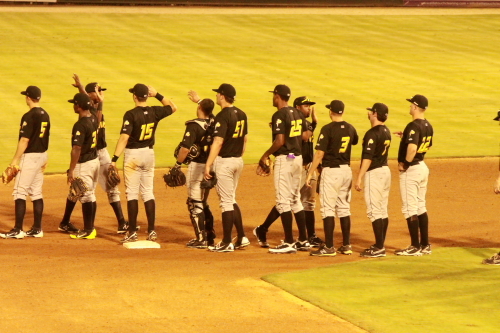 The Power celebrate their victory in Kannapolis. After this game they are 46-41 on the season and The Intimidators are not being to intimidating in The S.A.L with a 34- and 53 record. That is it for this one in Kannapolis may have another game coming up this weekend before heading back to Denver for the All-Star week and Roxivus next weekend. Till then see you around. 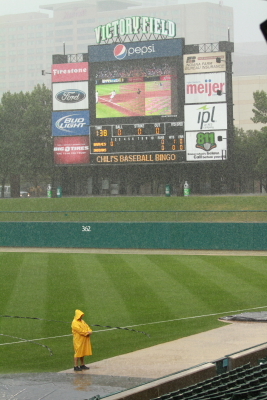 Two tribes battle it out in the rain in Indy! 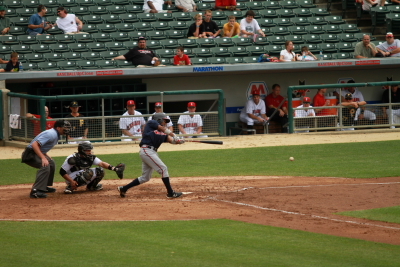 Gwinnett Braves Triple A affiliate of the Atlanta Braves Vs Indianapolis Indians Triple A affiliates of the Pittsburgh Pirates. This was the 15th game of my road trip. 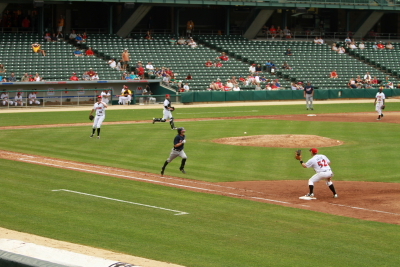 This was the 2nd game at Victory Field in Indianapolis. After taking a few laps around the Ballpark area looking for parking since the parking lot we parked in sunday was for employees of the building during the week and others were full. I found a parking lot across the street from Lucas Oil Stadium. Still think this looks like an airplane hangar. 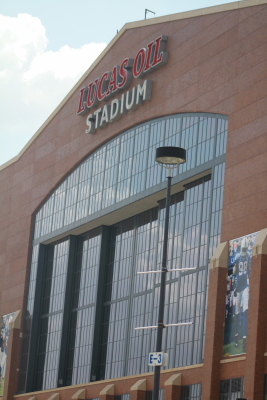 Lucas Oil Stadium hosted the Super Bowl XLVI (46 for the roman numeral challenged) in February. 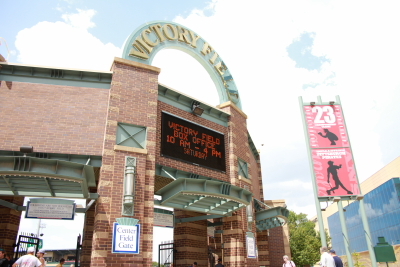 I took the short walk to Victory Field. This is a look at the Center Field entrance at the corner of West Maryland Street and South West Street. After getting my ticket and taking some photos outside. I looked across S.West St. and noticed this…. … yes that says 104 degrees. This was about 50 minutes before first pitch. Despite the temperature I still took a walk around the stadium. 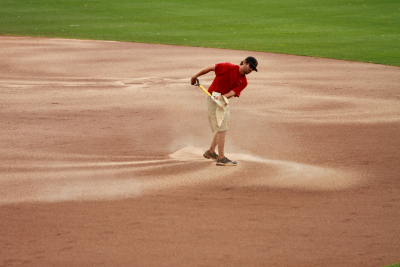 This photo is of the grounds crew putting down the foul lines. This was the first time I have seen this proceed use it is a box with a filter on the bottom the place them on the ground and tap them with mallets these with baseballs on the end of a hammer handle. 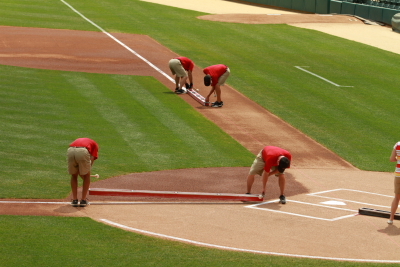 Somebody at the game said they do this at Great American Ball Park and in Columbus at Huntington Park. That is where the Columbus Clippers play. 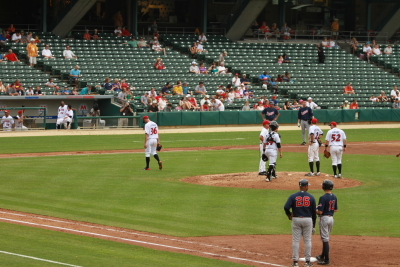 Ex Rockie Jose Morales was the starting catcher for the Indians. 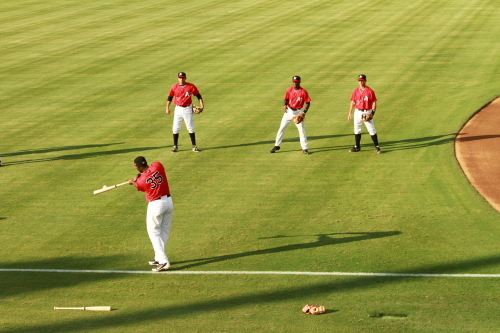 Here is a look of the indians stretching before the game with the J.W. Marriott and the Indianapolis skyline in the background. 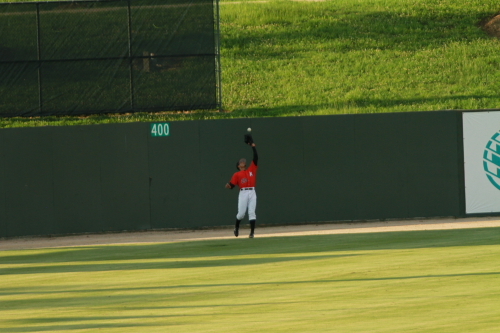 Indians starting pitcher Daniel Cabrera throwing in the outfield. 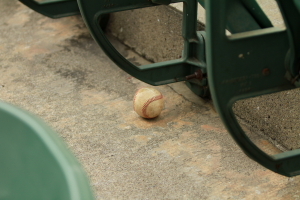 I then noticed this easter egg under a seat along the left field line. This ball looked very used had no logos or other marks. This was the first ball I have gotten at this stadium and the first of the day. 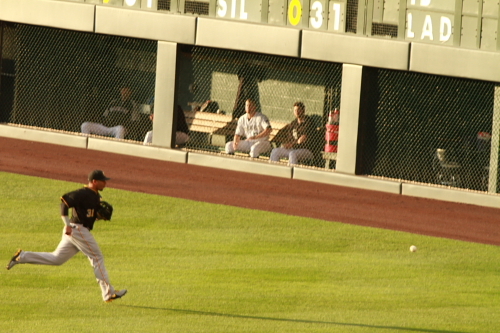 Cabrera throwing in the bullpen. Jose Morales catching in the bullpen. 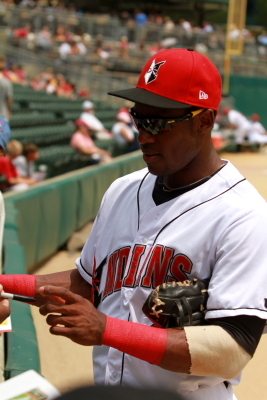 Starling Marte signing autographs for fans. I had him, Chase D’Arnaud and Anderson Hernandez to sign my program. While i was by the wall for autos I met a fellow road tripper David who was also doing a road trip his Included Columbus, Cincinnati, The Louisville Bat factory, The Football Hall of Fame and Rock and Roll H.O.F. and other places. He was the person who told me about the boxes the were using for the lines. Cabrera throwing the first pitch to the Braves Jose Costanza popped out to third. For the first out. Josh Wilson flew out to center. Felix Pie would hit a double. (pronounced PeeYea). The next batter Ernesto Mejia grounded out to end the inning. 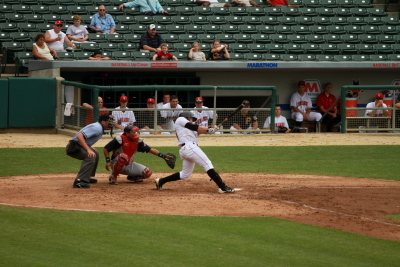 Mejia taking a swing in the first. I walked to me seat in the process of the inning. Today I got a seat in the second deck on the first baseline. Both times I have been to this stadium I sat on the 3rd base side in the lower seating. Almost immediately after the Braves 3rd out it started to pour. It was a slight rain during Mejia’s at bat, but before the first pitch could be thrown for the Braves the grounds crew pulled out the tarp. So I headed to the concourse on the lower level to escape the rain. Here are a few photos during the rain delay. 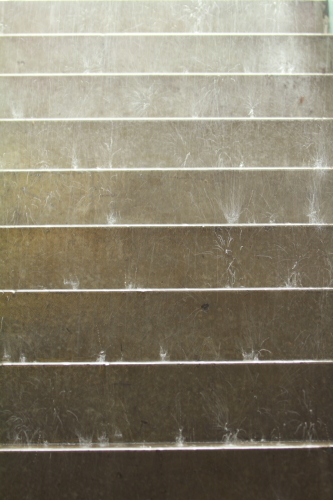 Here is the water running down the steps while more drops fell. 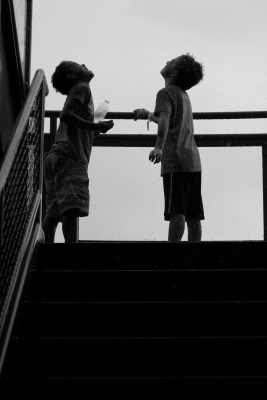 I than looked up one of the stair cases and caught these to enjoying the rain. This was a well needed storm in the area. 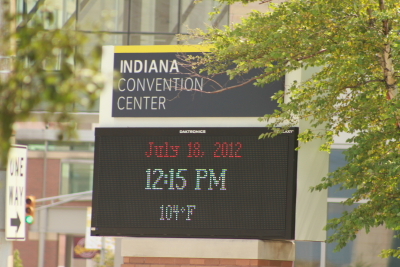 The Indianapolis area has been in a severe draught the whole summer. With many water restrictions in effect. I think this security guard should be the highest paid person to step on the field for this afternoon because he stood there the whole rain delay. Major props to him. 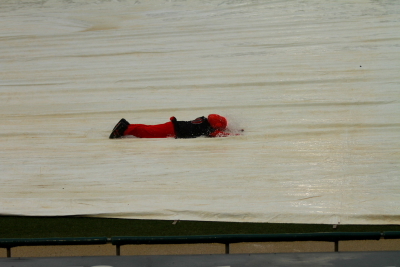 Rowdy had some fun with the rain and the tarp, while entertaining the crowd! 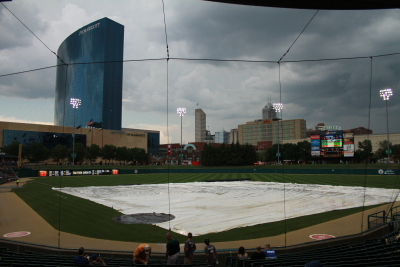 A look of the field with the tarp and a rain-soaked Indianapolis in the background. The odd thing was that this rain delay was 2 hours and 27 minutes of almost continues rain and my relatives that live about 8 miles away did not see a single drop. Jose Morales and Daniel Cabrera waiting in the dugout during the first slow down of the rain it would come down hard again and the rain delay continued. During the rain delay I met back up with David and we talked about our road trips. I was really cool meeting with someone else actually doing a trip. I have met many Rockies fans at away stadiums, but not someone doing a full road trip to many stadiums in a single trip like I do. 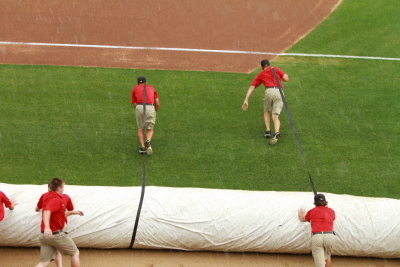 After about 2 hours the tarp was removed and they started working on the field. 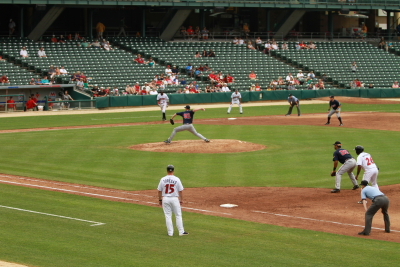 The Braves finally took the field to resume the first inning. 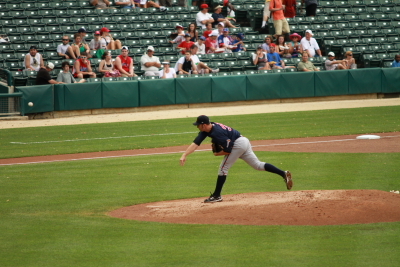 Here is there starting pitcher Eric Junge throws the first pitch to the Indians Chase d’Arnaud. d’Arnaud lead the inning off with a single. 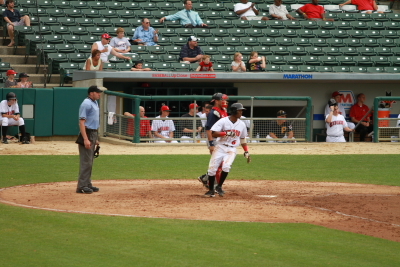 He and Yamaico Navarro were the only 2 base runners for the Indians Navarro walked. 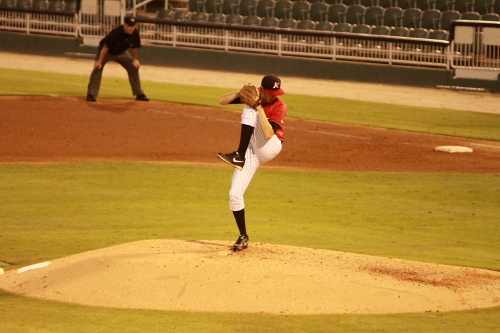 Chris Leroux came into pitch the second inning because of the long rain delay. 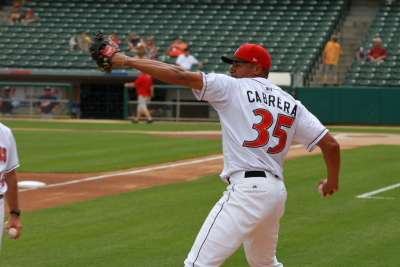 The Indians did not bring Cabrera back out. Leroux sat the braves down in order. The Braves did the same in the 3rd. 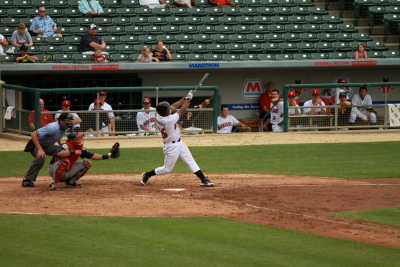 Jose Constanza at bat in the 3rd inning. 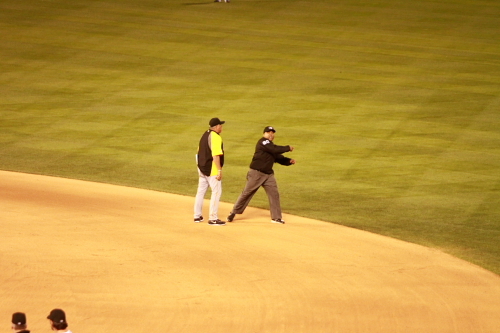 He hit the ball to second and was thrown out at first. 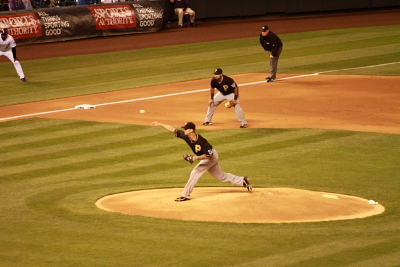 d’Arnaud strikes out for a strike in the 3rd inning. He would actually walk this at bat. 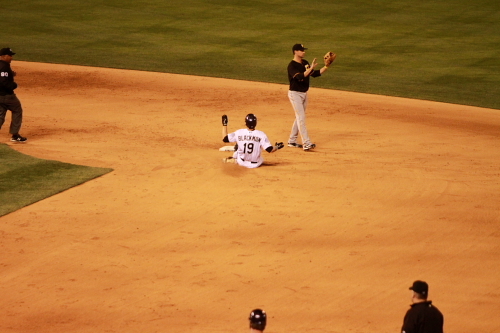 He was thrown out trying to steal second. 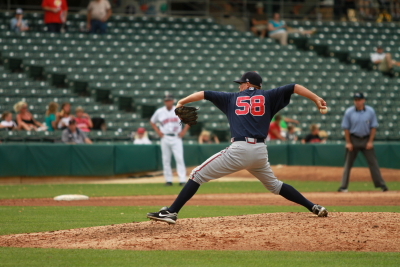 Billy Bullock pitched for the Braves in the 4th inning. Here he is warming up in the bullpen. 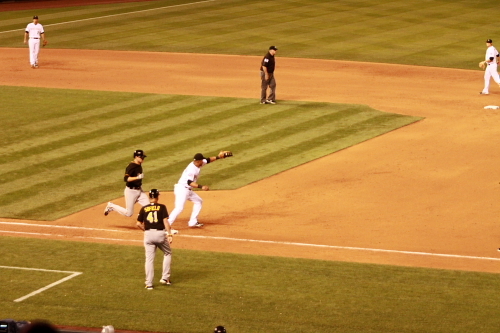 Starling Marte hits to third for ground out to lead off the 4th for the Indians once again they would go down in order. 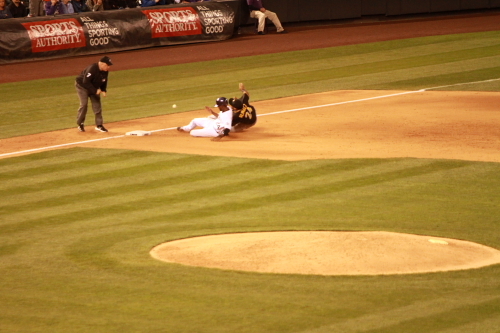 Leroux got pulled out in the 5th. 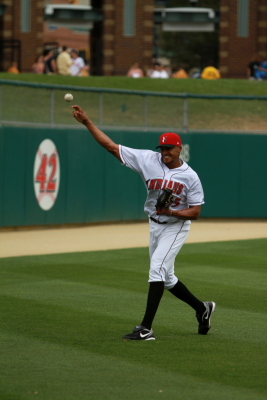 Brian Morris would come into pitch for the Indians. With runners on in the 5th Morris contributes offensively for the Indians. move 2 runners over. The Indians did not utilize the 2 runners in scoring position and Chase d’Arnaud popped out to short to end the inning for the Indians. 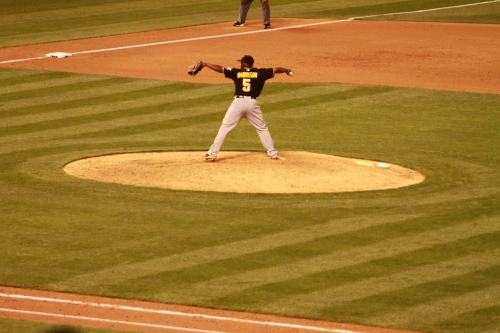 Morris getting out in the 5th inning. 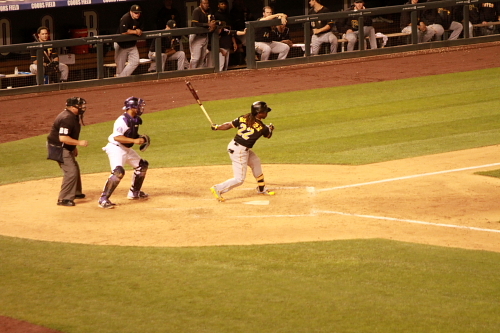 Starling Marte takes a swing in the 6th to get on base. 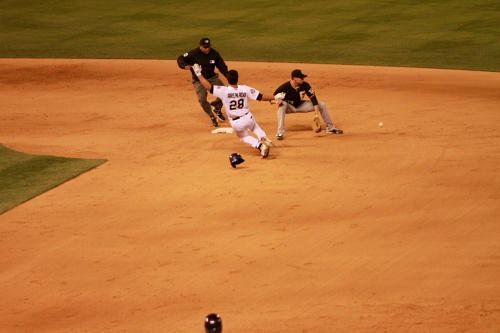 He got on base but Anderson Hernandez was out st second. 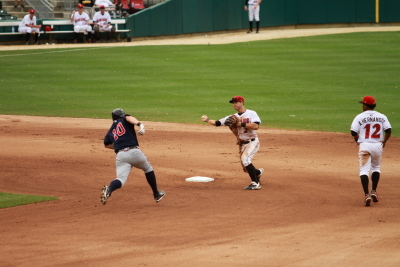 Anderson breaking up the double play at second. 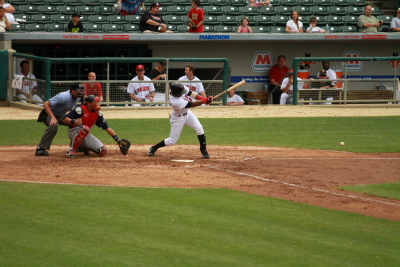 Yamaico Navarro takes a swing in the 6th inning. 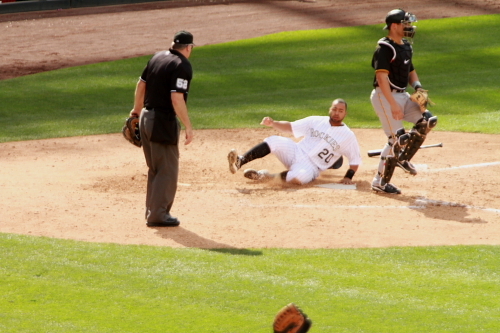 Matt Hague safely slides into second on a Navarro single. 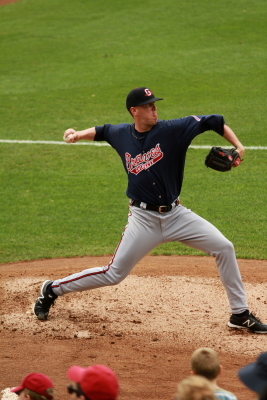 Adam Russell came in to pitch for the Braves with bases loaded in the 6th. 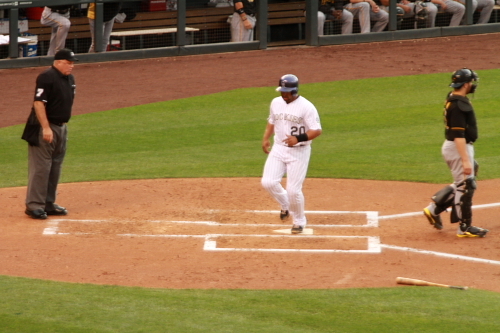 Jose Morales would hit a single to score Marte and Matt Hague to tie the game at 2. 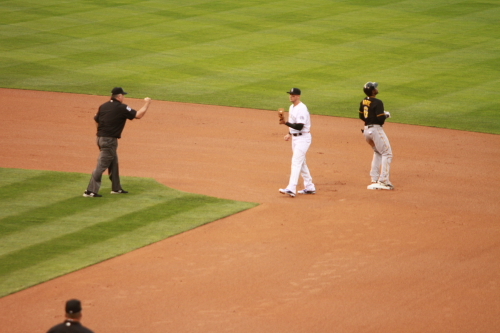 Marte crossing the plate for the Indians first run. 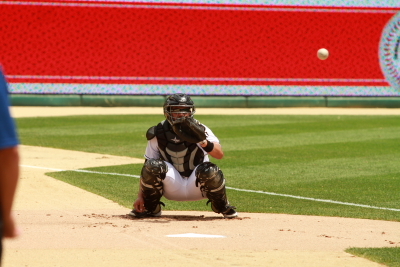 Eric Fryer would than hit a single to score Yamaico Navario to take the lead 3-2. 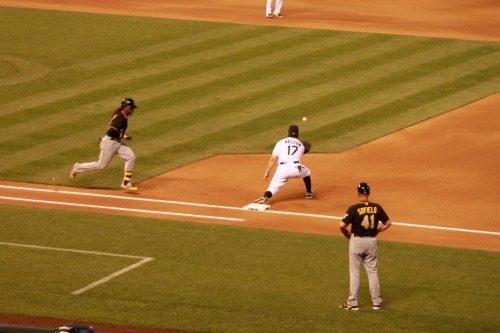 Terry Tifee pinch hit for the Braves in the 7th here is d’Arnaud turning a double play to end the 7th. 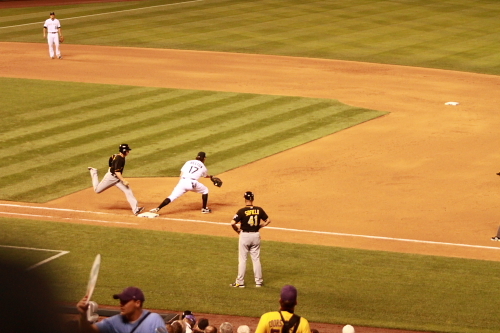 d’Arnaud slides into third for his 7th inning lead off triple. He would score on a Hernandez fly out (4-2) Indians. 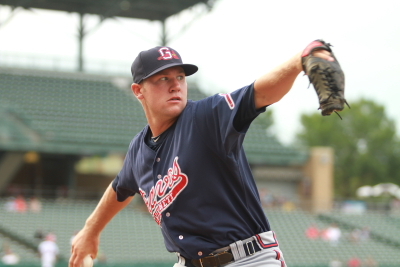 Josh Wilson grounds out for the Braves first out of the 8th inning. 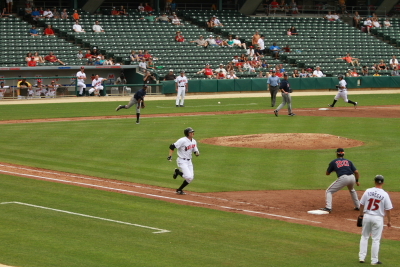 Morales was the only runner for the Indians in the 8th he got on base on a walk. 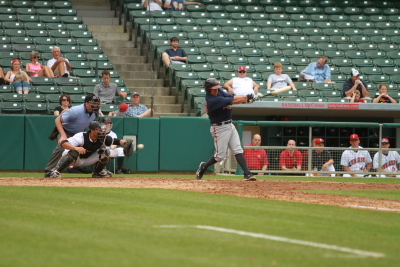 Stephan Gartrell lead off the 9th for the Braves with a single in this photo he is swinging for a strike but did get a single. 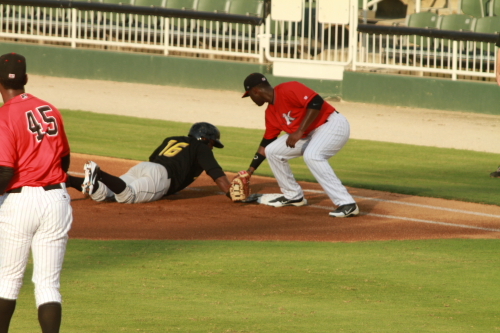 Tifee steps on second as the pinch runner for Boscon, Luis Durango scores at home. Jay Chapman warms up in the bullpen for the Braves with hopes of the Braves taking the lead and he would pitch in the 9th for the Braves. The Braves did send 9 batters to the plate and score 4 runs to take the lead 6-4. He did get to pitch the 9th. 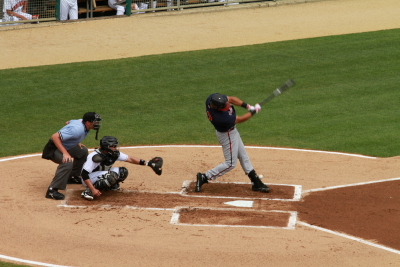 Anderson Hernandez swings at a pitch for a strike. 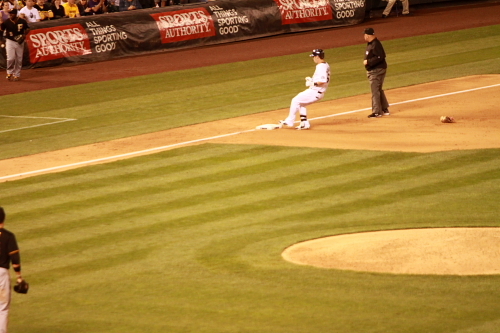 He was the last out he grounded out to second. Chapman would sit the Indians down in order in the 9th and the game was over after a 2 hr. 27 min. rain delay and the game taking 3hrs and 24mins. to play the game ended the Braves Won 6-4. That was the end of the game and my road trip. I hung around a few minutes to see if I could get a ball while they were cleaning the dugout and did not get one. Everyone I asked said they could not touch them including a bat boy. Josh Wilson was the player of the game after he did a post game interview he signed some autographs. Here he is grabbing a ball from David to sign. So that was it for the game and my road trip. This was the 4th home team loss I have seen on this trip so the home record was 10 win 4 losses for my trip. Saw some great games. Met many cool people. Like always i would like to thanks everyone that let me stay with them including Amy’s Aunt, Uncles and cousins for getting ticket’s in Arlington and staying with them. To My family all over for letting me stay with them and everything else involved, Eating, driving going to games help with my truck and supporting this trip. … and there it was the second ball. 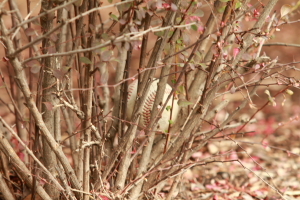 Who said baseballs don’t grow on trees. It must have been from BP who knows how long it was there but it was my second easter egg of the game. It was a very faded International League ball. I am now home and after a long 16 and a half hour drive from Indy I got in about 10:30 last night. It took so long today to write this post because ontop of un packing and settle into being home. It was a rough day in Denver and I would like to send my condolences, my heart and prayers for the victims, family, friends and the whole Denver Community that was affected by the shooting during the night at The Aurora Town Center. Well that’s it for this post and my road trip to use the home record of my trip to sign off 10-4 over and out. I will be back at Coors next week see you there!!! Jason Hammel heading to the bullpen for warm ups. Seth Smith either just scored a touchdown for the Jets or he is doing is best Laura Ingles impersonation! Jhoulys Chacin and Rafael Betancourt in the Rockies Dugout!!! Chris Iannetta and Jason Hammel Heading in for the game. 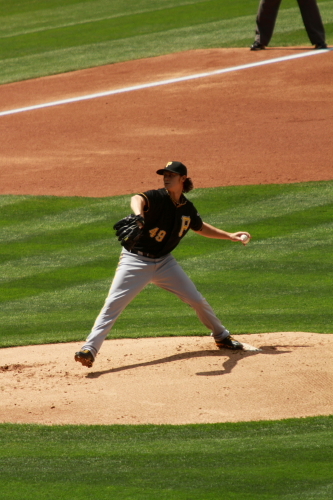 Jason Hammel throws the first pitch to Pirates Centerfielder Andrew McCutchen. 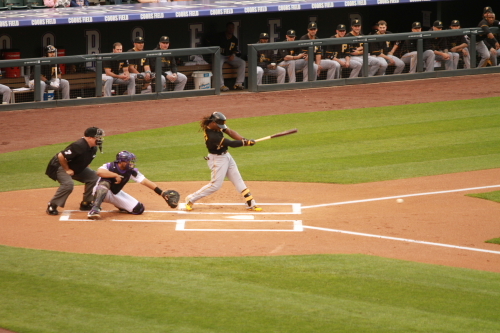 The second pitch wasn’t as good McCutchen hit a lead off solo HR. 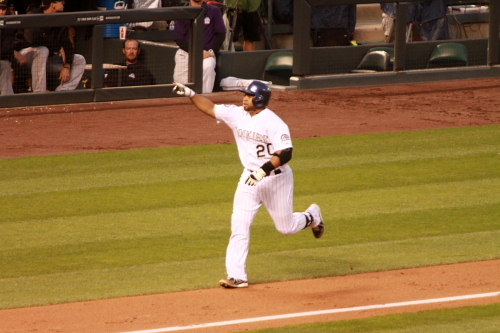 Thta was the second night he homered against the Rockies in this series. 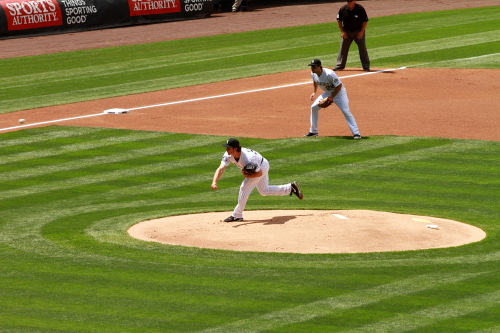 Hammel held it together well and keeping his pitch count low for him through the game. He ended up pitching 7 innings. Lettimg up 7 hits and only 1 run. He threw 105 pitches, averaging about 15 pitches per inning. The 4th was his only high pitch inning where he did walk 2 batters but got himself out of the inning. 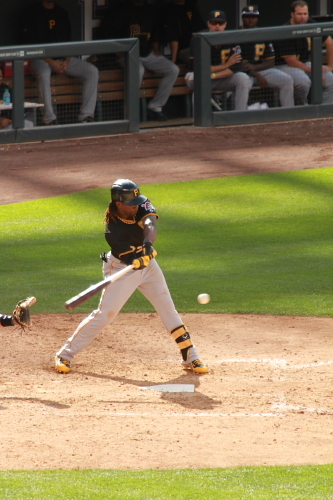 Jose Tabata swinging at a pitch in the 1st inning. he was taken out of the game after the first for somereason not sure or havent heard why. The Deuce making the off balance throw to 1st he makes this look so easy. Kids don’t try this at home!! 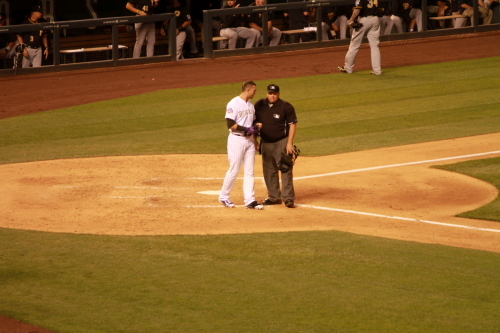 Well MLBLOGS is F’d up once again trying to finish this post for 2 days still can’t load photo’s The Rockies won 4-1. Rox Fans celabrated from at the Root Sports Desk and Gary X and I Tossed out the Helmer Is My HomeBoy T-Shirts. 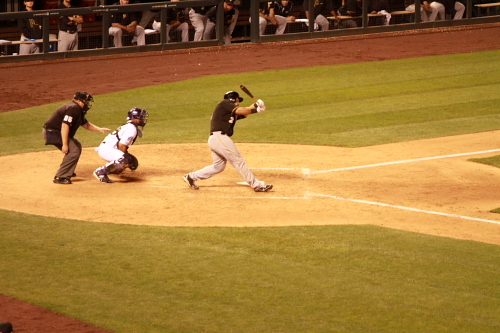 Chris Iannetta hit a 3 run HR in the 2nd after Cargo scored on a Smith single. making the score 4-1 and thats all that was scored or needed. for the game. Way to Go Chris hope things pick up for him they seem like he has coming around. 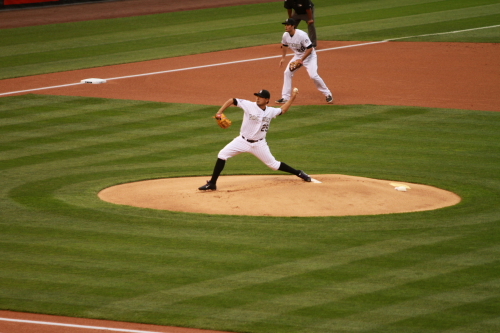 Hammel pitched a great game he went 7 innings including 3 1,2,3 innings. 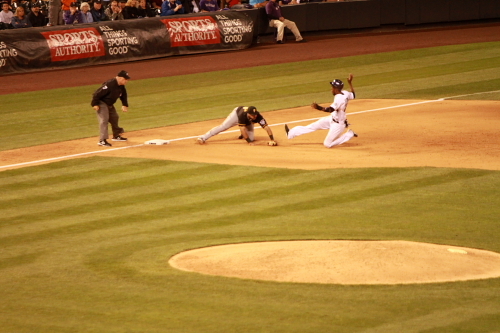 Dexter Fowler puting down the bunt in the 1st inning he was thrown out at first. 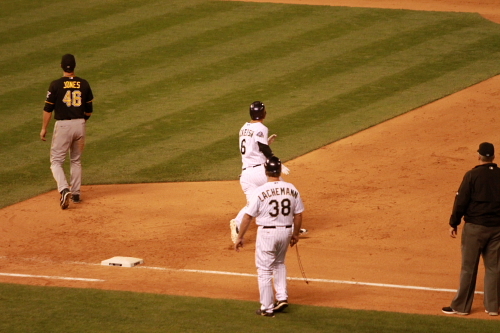 Todd Helton rounding first for a double it was his 533 double bringing him 1 away from catching Lou Gehrig on the all time list. he is currently 32 on the all time list with Bobby Abreu right behind him on the all time list with 531. WELL I WAS ON A GOOD RUN WITH MLBLOGS WORKING NOW IT IS MESSED UP AGAIN!!!!!!!!! !3 DAYS AND STILL CAN”T FINISH THIS POST. Well til next time I may complete this post, I may Not, I possibly may even attempt a post for the May 1st game against the Pirates. 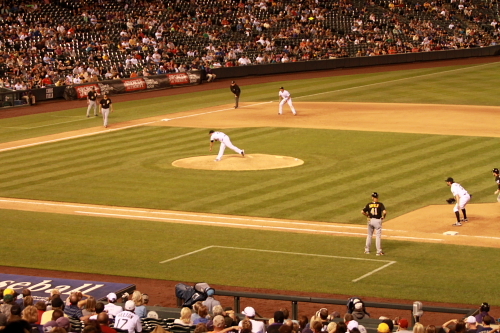 If Not see you at Coors next week when the NY Mets come to The 5280 on May 9,10 and 11th. I will see you their! This is an Entry of my 2010 East coast Trip. My trip was from August 5th thru August 19th. After a day Game at Coors Against the now World Champion S.F. Giants I headed east. First driving 17 Hours to a relatives in Indianapolis. 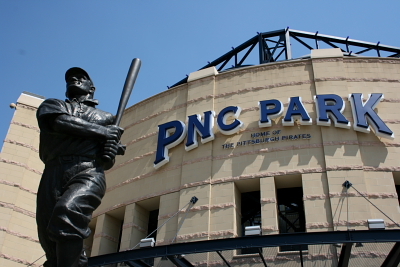 After a Day there I got in my truck and headed to my first Baseball Destination PNC Park in Pittsburgh. It was the 3rd game of the 4 game series. I arrived at PNC about 5 hours before the game started and 3 before the gates opened. Here are some photos from my trip this entry is only part one of the trip 8/7-8/10. After a 6 hour drive from Indy to Pittsburgh I arrived at my first stop PNC Park home of the Pittsburgh Pirates. This photo is at the home plate entrance of PNC Park. The Statue is of Honus Wagner who played with the Pirates From 1900 – 1917. Above is a Roberto Clemente statue located outside one of the Left Field entances. I found it intresting how the whole neighborhood around the ball park shows their support for the Pirates. Evan the Police baracades closing the streets show support to their home team. After waiting by the players entrance I noticed a bus pulled into the loading dock. So I went over to see what was going on and Jason Giambi was signing Autos. I kept my promise from spring training that I would not ask him for an auto after he Signed a card and my 2010 Rockies Team Ball. After the early gates open the only place you can acces is the riverwalk before they open up the gates to be able to get to seats. You can actually snag Bp homers out there if it clears the seats and the iron fence. If it does not hit the unexpecting fan who has know clue. A view of PNC from Left Field during batting practice. The PNC scoreboard with the Rockies starting line up. Dexter Fowler taking a swing during batting practice. I did get one ball at PNC, During batting practice that was hit on to Riverwalk in left field. which bounced of a PNC ATM machine. 1 of the many statues and monuments celabrating the players from the Pirate through the years. This one is of Ralph Kiners hands and bat. A view of the field from the 3rd baseside . Tom Helmer and the Cowboy during the pre game. Heres one for the Rockpile Ranter !!! It’s the hosers at PNC Park. The Rockies Line up for the National Anthem. George Thorogood throws out the Ceremonial 1st pitch. Ross Ohlendorf throws 1st pitch to Dexter Fowler. 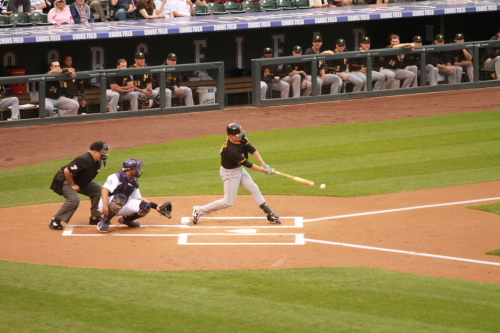 Rockies fans may remember Ohlendorf as the guy that Tulo’s line drive hit in the head on 7-28-2010 when the Pirates where at Coors Field. 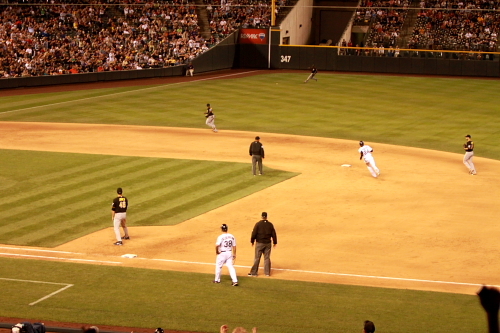 Cargo steals 2nd base in the 1st inning. 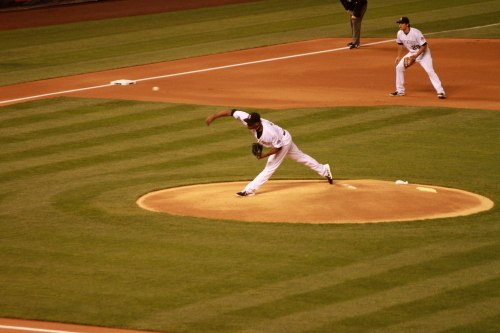 Jorge De La Rosa was the starting pitcher that night. He went 6 scoreless innings til he let up a home run to Snyder. A seat at PNC Park. The Scoreboard at the end of the game the Pirates won 7-5 with a 2 run walk off Home run in the top of the 10th inning by Pedro Alvarez. Following the Game it was Fireworks night and George Thorogood concert which I hung around to see a little of before heading to New York. 8-8-2010: After Driving over night from Pittsburgh I arrived on Long Island with in hours of arriving I was heading to Brooklyn with my long time friend Chris to see a Brooklyn Cyclones game. The Brooklyn Cyclone are a single a short season affiliate of the NY Mets. 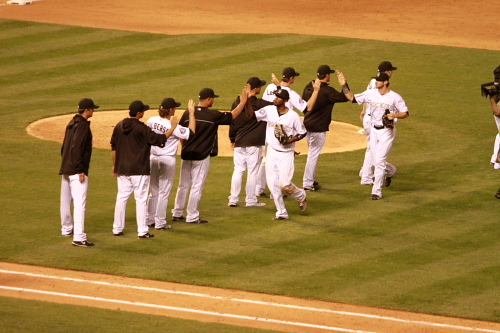 That night they Played against the CT. Tigers. A view of MCU Park from behind homeplate. Featuring the Steeplechase tower the only thing left of what was the steeplechase amusment park. A view of the MCU Parks scoreboard with a replica of the famous Coney Island roller coaster which the team is named for the Cyclone. A seat at MCU Park. Brookyn Cyclone’s Manager and former NY Mets 2nd Baseman Wally Backman. Brooklyn Cyclones Outfielder and top prospects Cory Vaughn at bat. In 2010 the Brooklyn Cyclones Celabrated 10 years as a baseball team in Brooklyn. A view from right field at MCU Park. Before leaving Coney Island I had to make a stop at the world famous Nathans for a hot dog. This was the first time I was ever there even know I lived in NY for 28 Years. The Third Game of my trip brought me to Islip Long Island Home of the Long Island Duck. The Ducks are part of the Atlantic League. Which is an Independent league with teams in NY, Conn, and NJ. 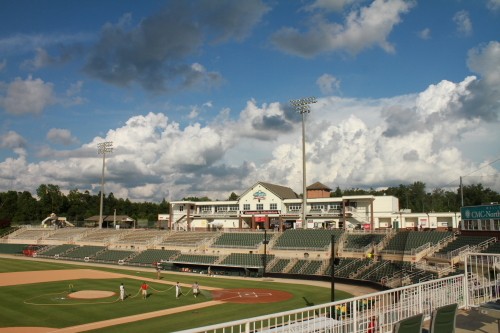 Their Stadium is now called Suffolk County Sports Park and was formaly known as EAB Park and Citipark. Before the Game I got to meet former Mets ShortStop and Coach Bud Harrelson. Bud is the only Mets Player and Coach to have been in uniform for both the 1969 and 1986 World Series Championship. So of cause I had him sign a few items!! Camden River Sharks Manager and former Phillie Von Hayes comes out in the 5th or 6th inning for a pitching change. I think the Riversharks used 5 or 6 pitches that night. On August 10, 2010 I attended my first baseball game in over 8 years in NY and my first at the new stadium of the New York Mets Citifield. Heres a look at Citifield outside of the Jackie Robinson Rotunda. Here is a Plaque in the sidewalk outside of Citifield which is one of my best memories growing up as a Mets fan.There are about 20 of these plaques outside the stadium with many memories from the Mets history including their 2 World Series Victories and other memorable games in their history. The Centerfield score board. The New York Mets 1986 World Series Trophy which is in the new Mets Hall of Fame located just inside the Jackie Robinson Rotunda in Citifield. This is a look at the control room for the stadiums LCD boards. 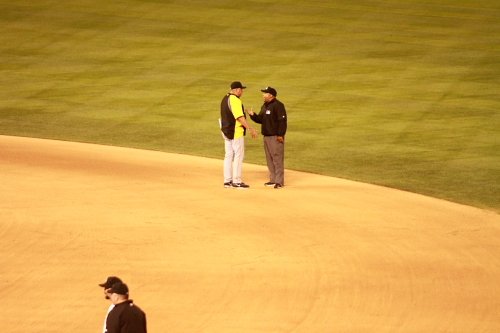 Rockies manager Jim Tracy and Mets Manager Jerry Manuels exchange Line ups. Ubaldo Jimenez Throws First Pitch to The Mets Jose Reyes.Going for his 18th win of the Year. A View of CitiField From My Seat in Section 316. Once again Thanks Rich For the great seats. Ubaldo only let up 4 hits and 1 run. He pitched 4 NoNo innings. The Game would of been totally different if the deep fly ball hit by Cargo with a runner on was a Homer like it would of been in 85% of the Major League Ballparks. See More photos, more games and ball parks coming up in part 2 of my east coast road trip. Look keep checking the Rox Addict Blog. For Part 2 of my east coast road trip.